Trade is an important development tool. Trade is not, however, an end itself. Increased trade volumes, and even increases in the value of trade, are not necessarily an indicator of improved human welfare or of development more generally. The critical question is: who benefits? The answer requires looking beyond aggregations of countries or regions, to understand the food production system with all its component parts: input providers, farmers, grain traders, transportation systems, food processors, retailers and consumers. This chapter is concerned with the way transnational agribusiness shapes trade and thus affects food security and development in developing countries. Through a discussion of market structures, and, in particular, of the market power of transnational agribusiness in world agricultural markets, the arguments presented suggest that improved trade rules and increased transparency about the operations of these businesses are essential if trade is to make a positive contribution to achieving food security for all. The AoA provides many negotiators with the framework for tackling the issues which are important to them: market access, domestic support and export subsidies. The AoA failed to curb spending on agriculture in rich countries or to create market access opportunities, but it at least provided the basis for further negotiations. This framework remains the most frequently cited positive outcome of the AoA. Two aspects of the AoA reflect abuses of power by developed countries: the lack of political will to implement the agreement and the capacity of rich countries to create exceptions to the rules for themselves. Both must be addressed, but they are not the only problems. Even were the European Union to end all export restitution payments, the United States, Japan, and EU to cease all payments to farmers, and all countries to establish duty-free market access for all agricultural products, agricultural market distortions would remain. These reforms alone would not ensure the most efficient use of limited natural and genetic resources. Perhaps most concretely, market distortions would continue to disrupt developing countries agriculture and to limit the potential welfare benefits of increased trade in agricultural products. Food security would not be guaranteed, nor would a decent livelihood for all those living from the land be assured. the inelastic nature of demand in agriculture: food is a fundamental human right; it must be accessible to all, not only those with purchasing power in the market. The demand for food is not fully captured in market-based transactions. the relatively inelastic nature of supply in agriculture: supply responses to shortfalls are slow, necessitating physical stocks to protect against weather-related or conflict - induced production shortfalls. Yet, the high cost of maintaining the stocks limits private sector interest in this service. The public sector is required to either purchase the service from private providers, or to maintain its own granaries. the political and economic weakness of most farmers: farmers are price-takers in the food system. Most government interventions in the agricultural sector assume farmers can respond to price signals by changing production. In fact, the response is asymmetric, with planting and investment in infrastructure rising when prices are high but remaining high even when prices fall. the horizontal and vertical integration of the agricultural system: a smaller number of companies now dominate each part of the food chain. the fact that countries do not trade; farmers do not trade: transnational agribusiness trades. The role of transnational corporations (TNCs) is increasing and calls into question some of the assumptions about the degree of competitiveness of global agricultural commodity markets. It is important to understand who benefits and who loses from these changes, but at the same time, why the changes are occurring and whether in fact they may be necessary. One factor may be that TNCs are becoming so large because agricultural commodity trading is very risky, requires a source of long-term capital on terms that can preclude effective participation by smaller players. To answer the question of who benefits, it is necessary to look beyond aggregations of regions, or even of countries, to understand the food production system with all its component parts: input providers, farmers, grain traders, transportation systems, food processors, retailers and consumers. It is critical to understand what is economically rational for the dominant transnational firms, because it is not the same set of concerns that drive producers, nor governments trying to maximize certain welfare gains. Policies designed with only producers, consumers, and government actors in mind miss the real drivers in much of the agricultural economy, whether local or global. Because transnational companies lobby vigorously to make sure that agricultural policies serve their trade interests, it is vital to understand transnational agribusiness operations in making policy aimed at enhancing food security. Two key aspects of market power are developed in this section: the horizontal and vertical integration of the agricultural system; and the privileged access to information capital and political influence. A small number of companies now dominate each part of the food chain in OECD countries. Chemical companies (now lead players in the seed business) are increasingly linked to grain traders and food processors in the production chain. The same companies buy, ship, and mill grain, then feed it to livestock or turn it into cereal, often crossing several national borders in the process. Fewer, bigger, more diversified across the range of commodities, and more vertically integrated upstream to the farmers level and downstream in transport and processing - this is how one can characterize trading houses now as compared to two decades ago. Horizontal integration refers to consolidation at a given point in the production process: a relatively small number of firms effectively control a given market. Horizontal concentration increases the market power of the dominant firms, enabling them to secure excessive profits. 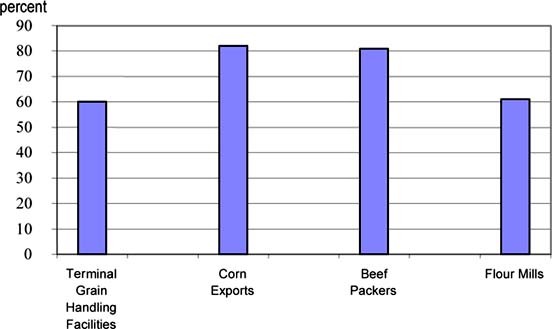 Figure 9.1 illustrates the level of concentration for several agricultural subsectors in the United States. 60 percent of terminal grain handling facilities are owned by four companies: Cargill, Cenex Harvest States, ADM and General Mills. 82 percent of corn exporting is concentrated in three companies: Cargill, ADM and Zen Noh. Beef packing is dominated by an 81 percent share among four companies: Tyson, ConAgra, Cargill and Farmland Nation. 61 percent of flour milling capacity is owned by four companies: ADM, ConAgra, Cargill and General Mills. Source: Heffernan, W., Hendrickson, M. & Gronski, R. 2002, Consolidation in the Food and Agriculture System, Report to the National Farmers Union, United States. A concentration ratio (known as CR4) where the top four firms control over 40 percent of a given market raises flags for economists concerned about maintaining competitive markets. In many agricultural sectors in the United States, this figure is well above this marker. Globally as well, a small number of firms control large parts of international commodity trade. For example, three companies control 90 percent of world coffee exports. Each of these companies has a turnover larger than most African economies. While concentration in the beef-packing industry in the United States has increased dramatically (CR4 increased from 36 percent to 75 percent between 1980 and 1992) the price spread between farm gate and wholesale prices fluctuated but did not show a trend increase. Reasons for this include relatively low barriers to entry, structural changes in the industry that saw rapid expansion in capacity and a change in the cast of companies that dominated the sector in the period considered. However, during the last ten years, the concentration of the top four companies in the beef packing industry continued to climb, reaching 81 percent. USDA data shows that between 1995 and 2000, the farm to wholesale price spread for beef increased by 24 percent, suggesting that having increased concentration, the companies left in the field were then able to increase their profit margin. The dominant transnational agribusiness firms are characterized not only by horizontal integration in a given sector, but also by their simultaneous dominance of multiple sectors of agricultural production, shipping and processing. Cargill, for example, is the largest grain exporter in the United States and probably in the world. It is dominant in wheat, soybeans, corn and cotton. It is also ranked seventh in the world as a food and beverage company. Cargill is also a major player in beef packing, ethanol, steel, fertilizer production and financial services. Vertical integration describes an industry where one company either owns, or controls through joint ventures, multiple stages in a production chain. For example, Dole owns plantations and canning facilities, and has the marketing power to bring pineapples from fields in the Philippines to consumers in many countries. The poultry industry in the United States is another example of vertical integration. Virtually all chicks raised for consumption as poultry are exchanged for money only when the meat processor sells them to the supermarket. All stages of production, from the hatching and rearing of the chicks to the slaughter of birds, are internal to the company. In this vertically integrated industry, there is no point at which prices for poultry can be discovered. The price charged for the chicks may be unfairly high, but these have become an internal question for managers to decide rather than a point where open market forces can intervene. As vertical integration is globalized, the open market assumptions upon which trade liberalization is based become less relevant to actual agribusiness operations. The companies that dominate the grain trade are part of vertically integrated conglomerates, whose financial interests are varied. For many of them, grain has become a cost in the production of livestock and processed foods, where profit margins are much greater than in the grain trade itself. As grain prices have collapsed over the last four years, livestock industries have benefited from the cheap feed that results. United States consumers, however, have continued to pay the same price for meat in the supermarket. The meat packing companies and supermarkets have captured the profit, measured in the spread between farm gate and wholesale prices. The sources of market power for transnational agribusiness are multifaceted, extending beyond concentrated market power. The companies also have privileged access to information, to capital and to political power, all of which help to limit competition by creating barriers to entry. Through their operations in well over 100 countries, the dominant transnational agribusiness firms have access to information that very few other actors, including most governments, can aspire to. Commodity prices depend not only on supply, but also on forecasts about the future availability of supply. Futures and options markets are risk management tools, helping to offset the exposure of contracting to supply a given amount of commodity ahead of harvest time. The commodity exchanges in practice seem to be less a way to spread risk, and more a way to concentrate profits for those who know the most about a market. Transnational agribusiness also has access to enormous sums of capital, necessary to cover futures and options contracts, and hence influence the prices by which trade-policy-mediated domestic support and export subsidies are set. At the same time, the global nature of their operations gives these firms a political voice in dozens of countries simultaneously, creating a powerful force for policies that reflect their interests. The only entities operating in the global market are some governments, working with private and intergovernmental agencies, dispensing food aid; a few remaining state importers and exporters; and transnational agribusiness. Trying to guess what will happen to food prices by looking at commodity markets is to look at only a small part of the equation. Until the role of grain companies, food processors and retailers (and the emerging alliances among them) are looked at, it is not possible to build a sound understanding of trade, nor to develop recommendations for changes to trade policy that will serve the public interest. The dominance of a few firms in multiple markets obviously affects the economics of the sector. For grain buyers and processors, the volume of sales is key to realizing profits. This is especially true when the companies own shipping, rail and barge companies, which need to be kept full and on the move to be profitable. As the companies acquire interests in milling, crushing and livestock operations, the overriding interest is to keep grain prices down. Large commodity traders can also benefit from price volatility, because they speculate on the commodity exchanges; the uncertainty, from the perspective of those without privileged access to information, increases the potential profits. Farmers and consumers, on the other hand, both share a strong overall interest in price stability. Commodity traders are not invulnerable. As in every other sector, agribusiness is changing. Firms traditionally based in processing, along with retailers, are reaching back into the food chain. Many of these companies now employ their own traders, brokering their own contracts with producers, and in various other ways squeezing out traditional commodity traders. Moreover, as firms grow larger and more diversified, they also increase their exposure to financial risk. By building in the impact of market power, analysts are forced to ask: who will benefit from increased trade volumes or increased market access? The World Bank estimates that between 1975 and 1993, producers of seven basic commodities worldwide were underpaid as much as US$96 billion. Ten years ago the world coffee economy was worth US$30 billion, of which producers received US$12 billion. In 2002 it was worth US$50 billion, yet producers received just $8 billion of that total. Vertical integration in the food and agricultural sector of the United States and the European Union deserves international attention because it undermines the assumptions that have persuaded governments to embrace trade agreements and change their agricultural policies to allow increased food imports. To date, few corporate mergers or joint ventures have received government, much less intergovernmental, scrutiny outside the country in which they are headquartered. However, this is an area of regulation that must get more attention because of effects in third-country markets, and because of the impact of vertical integration on the price and availability of food in the world market. documenting transnational agribusiness, to understand its global market reach better. This could mirror the WTO questionnaire required by countries that operate state-trading enterprises. evaluating the sources of market distortion, whether public or private, and discussing how best to address them. For example, rather than focus on export subsidies alone, trade negotiators should look at dumping more broadly, comparing cost of production prices (with a reasonable profit) in the country of origin to the price offered in the international market. The persistent dumping that currently characterizes commodity trade could be remedied through import tariffs or export taxes imposed in the country of origin. creating a multilateral working group to discuss competition issues specifically related to international agricultural trade. This chapter is based on a paper by Sophia Murphy, Market Structure and the Gains from Trade commissioned for the Expert Consultation on Trade and Food Security: Conceptualizing the Linkages. 11-12 July 2002, Rome. Rodrik, D. 2001, The Global Governance of Trade as if Development Really Mattered, UNDP Background Paper, U.S.A.: October 2001. UNCTAD. 1999. The impact of changing supply-and-demand market structures on commodity prices and exports of major interest to developing countries, p. 10, Report by the UN Conference on Trade and Development Secretariat to the Commission of Trade in Goods, and Commodities. 7-8 July 1999, Geneva. Redfern, A. Third World Perspective, in Proceedings of a meeting of the British Society of Animal Science and the Scottish Centre for Animal Welfare Sciences, April 2002. MacDonald, J.M. 2001, Agribusiness Concentration, Competition and NAFTA, Economic Research Service, US Department of Agriculture, p. 9. Hendrickson, M. & Heffernan, W. 2002, Concentration of Agricultural Markets, report for National Farmers Union, Washington DC. On-line at: nfu.org/documents/01_02_Concentration_report.pdf. Carstensen, P.C. 2000, Competition, Concentration and Agriculture, A Food and Agriculture Policy for the 21st Century, M.C. Stumo (ed.) Organization for Competitive Markets, Nebraska, p. 32. Hendrickson, M. & Heffernan, W. 2002. op cit. Redfern, A. 2002 op cit. Manchester Guardian, available at: www.globalexchange.org/economy/coffee. Ritchie, M., Wisniewski, S. & Murphy, S. 2000. Dumping as a structural feature of us agriculture: can WTO rules solve the problem? Institute for Agriculture and Trade Policy, Minnesota, USA.